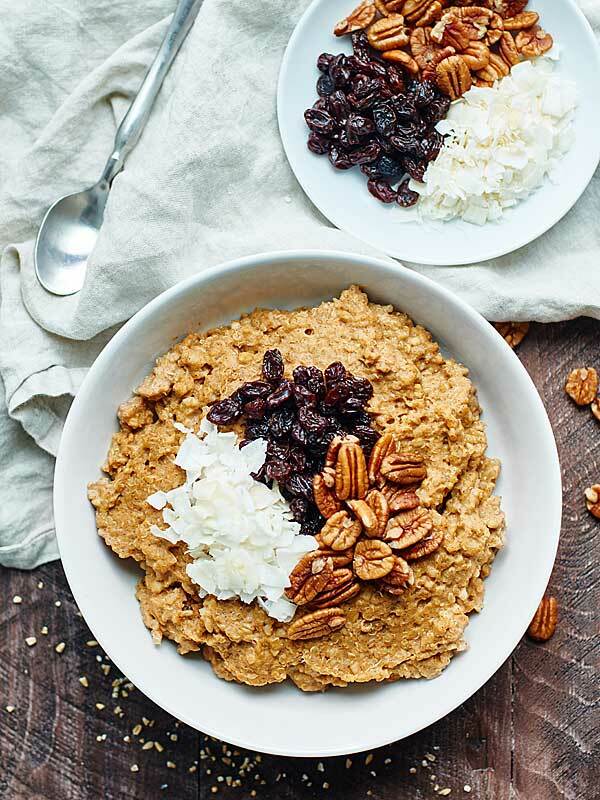 This Crockpot Pumpkin Oatmeal w/ Quinoa can be made in advanced, is super healthy, and tastes like pumpkin pie! Crockpot. Pumpkin. Oatmeal. Quinoa. Maple. Cozy spices. Does it get any more “fall” than that?! I’ve also been loving quinoa lately. It satisfies my carb-y loving self, but in a much healthier way (helllooo protein!). If you haven’t, be sure to check out my Healthy Mexican Casserole. It’s totally yum. I haven’t made a crockpot breakfast before, so of course, I needed to share one with you guys. Plus, it’s November, so you guys aren’t too sick of pumpkin yet…right? 🙂 Long story short –> Crockpot Pumpkin Oatmeal w/ Quinoa was born. When I first told Trevor about my idea to make crockpot pumpkin oatmeal…yeahh… he wasn’t feelin’ it. Let’s just say, he was not excited. A few hours later, he emerged from his office…”What is that smell?!”. Let’s just say, he WAS excited. He absolutely loved it and I can see why! It’s a warm and cozy, stick-to-your-ribs dish, that’s totally healthy and satisfying! 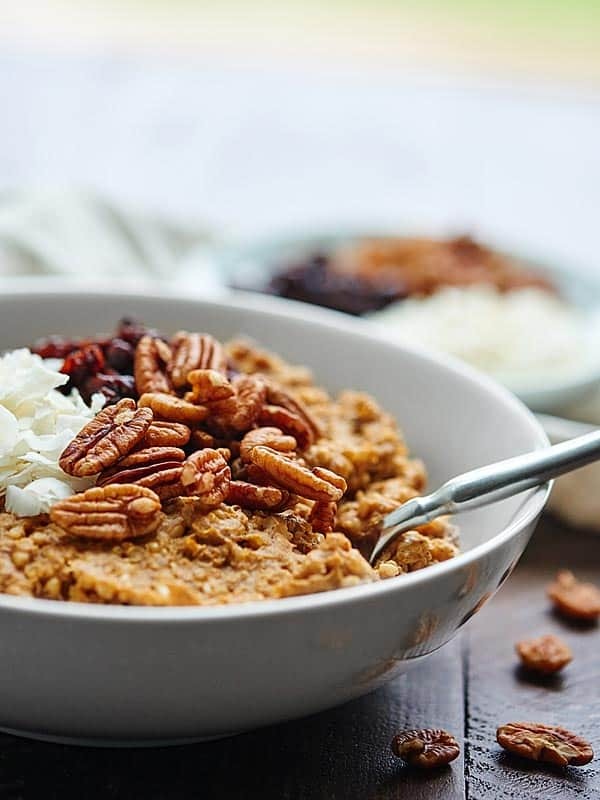 The texture of these crockpot pumpkin oats is crazy good: thick with some bite from the quinoa and steel cut oats and don’t even get me started on the flavor: it tastes like pumpkin pie! You can thank a whole can of pumpkin puree and a whole lotta spices for that. These oats are great, because they taste amazing, but they’re also great, because they’re SO stinkin’ easy to make. 1. Spray your slow cooker with cooking spray. 2. Dump in almond milk, eggs (for extra protein #winning), pumpkin puree, maple syrup, salt, cinnamon, ginger, nutmeg, cloves, and vanilla <– whisk that alllll together. 3. Stir in quinoa and steel cut oats. DONE. 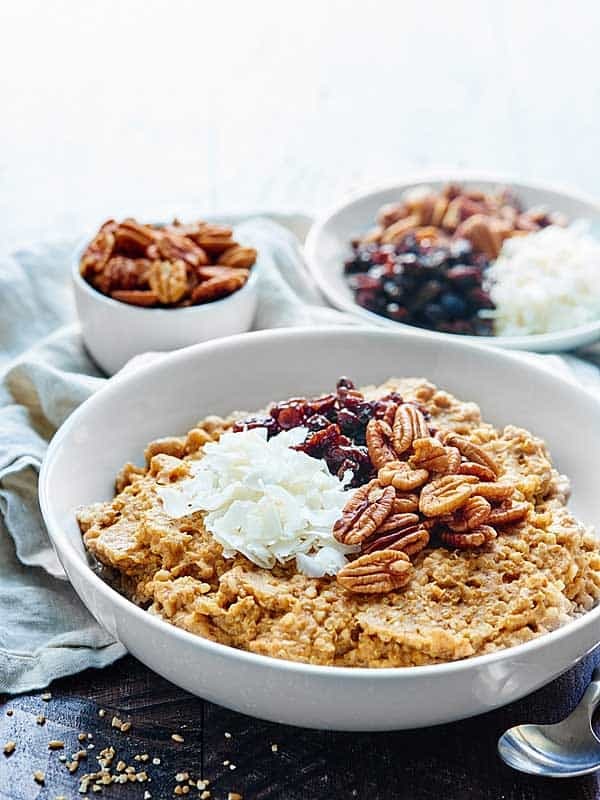 I’d suggest making this crockpot pumpkin oatmeal on a cold Sunday afternoon and having it as a healthy, cozy breakfast for the rest of the week! Gotta love a recipe that makes a t.o.n. BTW – what takes this recipe from great to AHHHH-mazing? The toppings. 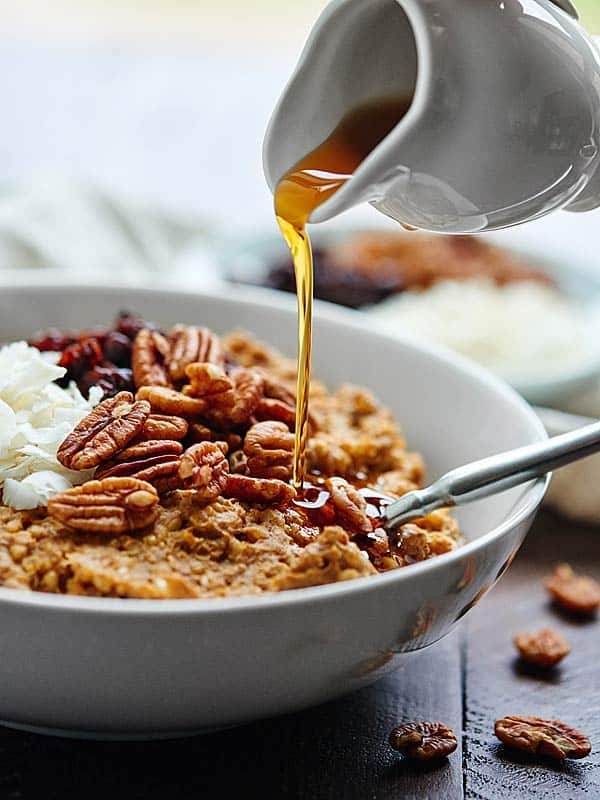 I’d highly suggest serving this pumpkin oatmeal with plenty of pecans – for some crunch, raisins – for some chew, and more maple syrup or even brown sugar – for a little more sweetness! 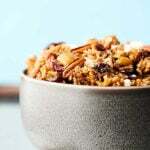 Easy, healthy, make ahead, pumpkin breakfast? If that’s not a perfect fall breakfast, I don’t know what is! 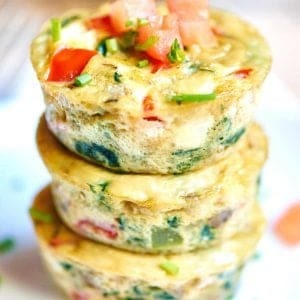 What are your favorite make ahead breakfast recipes? Show me the yummy! Spray crockpot with cooking spray. Spray it really, really well or else it will stick. 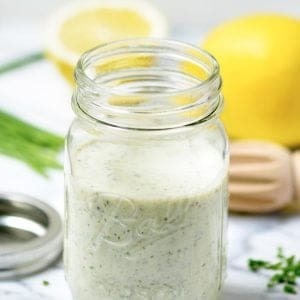 Whisk together ingredients directly in crockpot: milk through vanilla. Make sure you really break that egg up. Whisk in quinoa/steel cut oats. Cover and cook on low for 4 hours. Stir and serve! 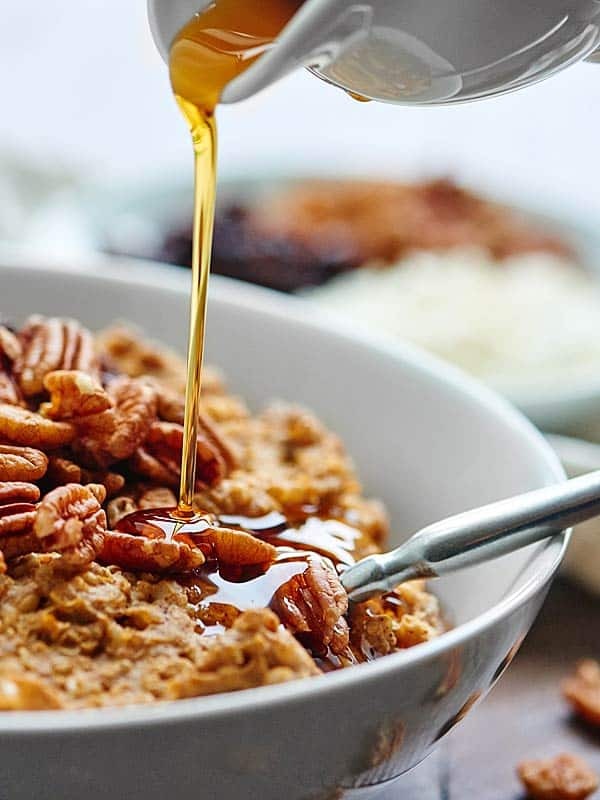 Top with pecans, raisins, more maple syrup or your choice of sweetener, etc. If the leftovers are too thick, feel free to thin these out with milk! 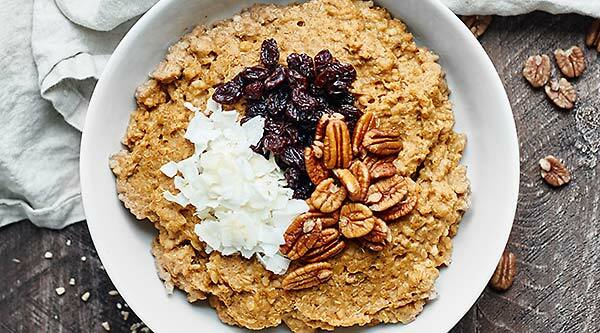 I have to try this for breakfast.. never made a crockpot quinoa before. Sounds like something I would make and like. Before I do, can you share nutritional info? Hi Karen! If serving 6, each serving would be 302 calories. 🙂 I hope that helps! Enjoy! Thank you. Made it and both of us really love it! Hi Karen! That’s great! So glad you both loved it. 🙂 Thanks for making the oatmeal! 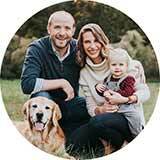 This look like something my whole family could enjoy! YES!! Wahoo!! Thanks so much Charlotte! Just checking – is it 1 1/2 tablespoons or teaspoons of cinnamon? The tablespoons seemed like a lot, so I thought I’d check so I don’t overspice it. 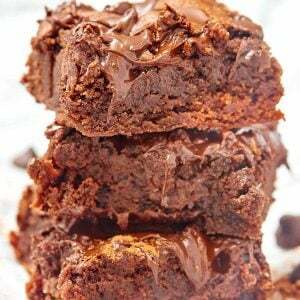 Any ideas on the calorie count for this recipe? This looks delicious – but I don’t have a small crockpot that cooks on low, can this be cooked on a stovetop or in a small crockpot on high? Thanks.